SAN FRANCISCO, CA -- (MARKET WIRE) -- 12/05/07 -- Keibi Technologies, Inc., provider of the only comprehensive moderation and classification solution for user generated content (UGC), today announced enhancements to the holistic scoring technology underlying the Keibi Moderation Suite and services. Keibi quickly identifies UGC that violates publisher's terms of service through the analysis of individual elements including images, animations, text, and video, allowing human moderators to focus on content and accounts most likely to be in violation of terms of service, greatly improving productivity. "Since we started using Keibi, we are removing 90 percent of problem content, while only reviewing 55 percent of the site's total UGC," said Keith Crowell, Director of Member Services and Safety at Piczo. "Everyone's struggling with how to improve moderation efforts. I have no doubt that Keibi will soon be the standard for content moderation for anyone with UGC." "Keibi's holistic UGC classification and moderation solutions deliver significant value over point solutions that simply use an image grader or text dictionary," said Paul Remer, CEO of Keibi Technologies. "Keibi looks at a variety of signals that indicate potential violations, including behavioral patterns and correlations across multiple content types and users, in order to more accurately identify problem content." Keibi identifies UGC that meets the content publisher's definition of obscenity, racism, violence, spam and abuse, enabling moderation staff to efficiently process problem content. The solution, which is available as a subscription-based service for moderation groups, also incorporates prior content decisions in future assessments to continually improve scoring performance over time. 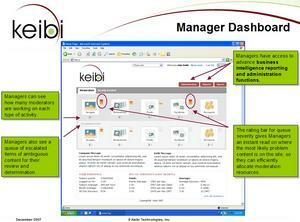 Keibi has also enhanced the functionality available to managers of moderation groups, providing intuitive dashboards to efficiently process items that have been escalated for review, manage the activity level of individual moderators, conduct quality assurance testing, and determine the overall risk of content that violates terms of service on their website. "User generated content is revolutionizing the very way we communicate online and live our daily lives," continued Remer. "We're dedicated to ensuring that web users, publishers, advertisers, and brands can safely interact in this medium and maximize the value of the experience." 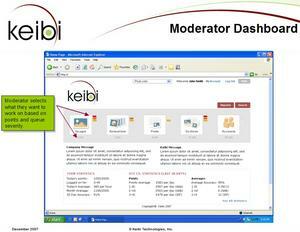 Keibi Technologies, Inc. provides a solution for the moderation and classification of user generated content. The Keibi Moderation Suite helps online communities, ad networks and advertisers capitalize on the value of social media. Founded in 2006, Keibi is headquartered in San Francisco and is backed by Hunt Ventures and Catamount Ventures. Current customers include Piczo, with additional trial users all in the social media market. More information is available at www.keibitech.com.